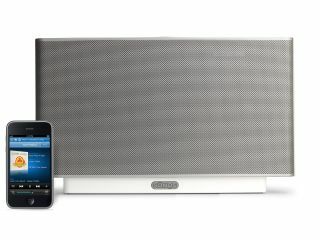 Sonos has revealed its latest software upgrade, which brings with it Apple AirPlay functionality. The update, known as Sonos System Software 3.4, is a free download that adds the AirPlay features as well as support for iPad and iPhone multitasking. Apple AirPlay allows users to stream music from their iPad, iPhone or iPod Touch to AirPlay-enabled speakers using an Apple peripheral called AirPort Express (which, sadly, is not free). The news Sonos update means you can by-pass the Sonos software altogether, avoiding the indexing of all your tunes for wireless access. "To offer AirPlay, most manufacturers require a chip from Apple so you have to buy a whole new speaker set; but we're making AirPlay compatibility available for free through this firmware update," Fiede Schillmoeller, Sonos' senior PR manager for EMEA told TechRadar. "That means even if you bought a Sonos system back in 2005, you can still use AirPlay. We think that's pretty cool." Sonos owners will need to do a spot of configuration before the AirPlay function will work, however. Sonos has made all the instructions easily available on its website though. "We're also providing the only true multi-room experience with 'AirPlay Party mode'," continued Craig Wisneski, senior product manager for Sonos. "You can send a song from your iPad or iPhone to multiple rooms in your house, so it plays simultaneously in each." The AirPlay compatibility also allows you to play music tracks from within apps on your Sonos speakers with just a simple on-screen output switch. It's not all about the Apple owners though; the 3.4 software upgrade is also the one that delivers Sonos Controller for Android, available from today.